I'll keep this short and sweet because there are no surprises here. A valid synopsis of Outlander is that it is: 1 Alien vs. many Vikings vs. many more Vikings vs. 1 giant beastie. As such it is an un-mitigated, preposterous action romp which wisely leaves pretensions about being an adaptation of the Beowulf story at the door, instead opting for the kind of silliness the above set-up suggests, nay, cries out for. And as such it is generic but fun action move fare for a Saturday night. 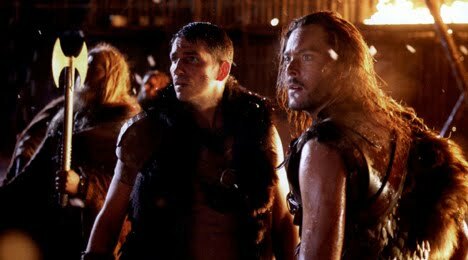 Heading up said silliness is Jim Caviezel, playing the role of hero-alien with assured, one-note, action hero aspirations as he quickly assumes command of the rag-tag Viking hordes to lead them in a fight against the massive Moorwen he feels responsible for bringing to their planet. In doing so there is satisfying levels of blood and guts, male bonding and a unique enemy that occasionally looks startlingly beautiful as it lights up to attract its victims. In a twist so out of left-field I never saw it coming the plot also features that most under-used of developments in action films... a love interest. It's formulaic stuff (on reflection, Caviezel's performance may be the very definition of one-note action hero) but it's unpretentious and fun and the cast are good enough to avoid the cheesy lines and sub par scripting that are normally waiting mid-sentence to beat any self-respecting audience member around the head with an iron war axe. A cheap and cheerful nineties action movie for the noughties.